Synopsis: In 2004, an eccentric misfit embarks on a mission from God to bring Osama Bin Laden to justice. Army of One is a movie about Gary Faulkner (Nic Cage – The Trust, Snowden), an eccentric living in a slightly altered reality to the rest of us, one in which he converses with a God who is not so much filled with mighty wrath as a perpetual state of peevishness. Unable to hold down a job, Gary sleeps on building sites or friend’s couches, and God comes to him in all manner of guises – infomercial host, truck driver, saloon patron – but always in the form of Russell Brand (Despicable Me, Trolls), which means he looks more like God Jr. than a traditional visualisation of the actual deity. Anyway, the latest thorn in God’s side is Osama Bin Laden – this is 2004, three years after 9/11 – and he tells Gary – an eccentric misfit with an excitable attitude, nasal voice and greying pony tail – that he is just the man to pull that thorn free and bring Bin Laden to justice. So Gary buys himself a Samurai sword and makes plans to sail to Pakistan, even though he’s just hooked up with Marci Mitchell (Wendi McLendon-Covey), a former classmate on whom he’s always had a crush, and still hasn’t completed construction of the ramp he promised to build for Marci’s disabled daughter (Chenoa Morison). His first attempt gets him as far as Mexico but, undeterred, he changes his plan, and elects to travel to Israel from where he will fly a hang glider into Pakistan. Perhaps the biggest miracle of Gary’s story is that he actually makes it there, and establishes a base at a run-down but friendly hotel. From there he makes daily scouting missions around the neighbourhood which inevitably turn out to be fruitless and serve only to bring him to the attention of the CIA, which doesn’t appreciate his presence in a highly sensitive area one little bit. 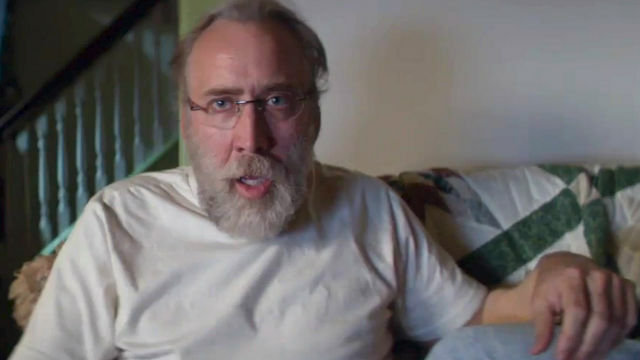 While Army of One’s story might be about Gary Faulkner, the movie itself is all about Nic Cage, an actor whose financial woes have seen him deliver lacklustre performances in a seemingly endless series of second-rate movies unworthy of the talents of an award-winning actor. For once, he finds a role that offers him the opportunity to inject some real life and character into a part, and he grabs it in the same way that a drowning man grasps a lifebelt. While it’s true that he exaggerates the real Faulkner’s mannerisms to emphasise his eccentricity, he’s more or less called upon to do so by the nature of the screenplay which understandably treats Faulkner’s escapades as a source of comedy. The problem then is that the movie ends up treading a thin line between celebrating Faulkner’s eccentricities and holding him up as a figure of ridicule; it’s not always successful, to be honest, but manages to remain on the right side of discretion to avoid becoming offensive most of the time. Cage holds it all together with an energised performance that shows his talent is still intact, and Army of One does as much as it can with Faulkner’s story without straying into the realms of fantasy, but it’s stretched pretty thin and the laughs are infrequent.